A new paper has just appeared in the proceedings of the royal society B entitled, “Language evolution: syntax before phonology?” by Collier et al. Phonology and syntax represent two layers of sound combination central to language’s expressive power. Comparative animal studies represent one approach to understand the origins of these combinatorial layers. Traditionally, phonology, where meaningless sounds form words, has been considered a simpler combination than syntax, and thus should be more common in animals. A linguistically informed review of animal call sequences demonstrates that phonology in animal vocal systems is rare, whereas syntax is more widespread. In the light of this and the absence of phonology in some languages, we hypothesize that syntax, present in all languages, evolved before phonology. This is essentially a paper about the distinction between combinatorial and compositional structure and the emergence narrative of duality of patterning. I wrote a post about this a few months ago, see here. The paper focusses on evidence from non-human animals and also evidence from human languages, including Al-Sayyid Bedouin Sign Language, looking at differences and similarities between human abilities and those of other animals. Peter Marler outlined different types of call combinations found in animal communication by making a distinction between ‘Phonological syntax’ (combinatorial structure), which he claims is widespread in animals, and ‘lexical syntax’ (compositional structure), which he claims have yet to be described in animals (I can’t find a copy of the 1998 paper which Collier et al. cite, but he talks about this on his homepage here). Collier et al. however, disagree and review several animal communication systems which they claim fall under a definition of “lexical syntax”. The paper reviews evidence from 4 species; 1) Winter wrens (though you could arguably lump all birdsong in with their analysis for this one), 2) Campbell monkeys, 3) Putty-nosed monkeys and 4) Banded mongooses. 1) Birdsong is argued to be combinatorial, as whatever the combination of notes or syllables, the songs always have the same purpose and so the “meaning” can not be argued to be a result of the combination. 2) In contrast to Marler, the authors argue that Campbell monkeys have compositional structure in their calls. 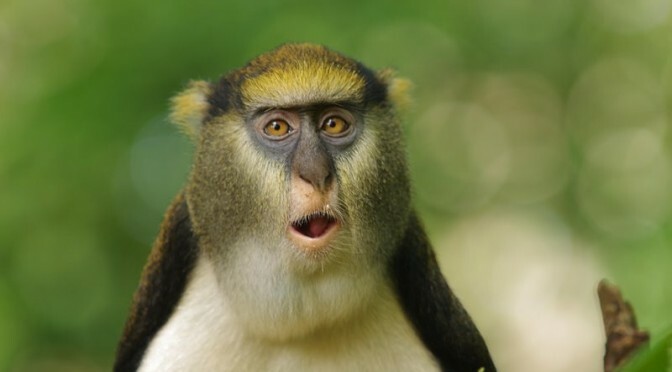 The monkeys give a ‘krak’ call when there is a leopard near, and a ‘hok’ call when there is an eagle. Interestingly, they can add an ‘-oo’ to either of these calls change their meanings. ‘Krak-oo’ denotes any general disturbance and ‘hok-oo’ denotes a disturbance in the canopy. One can argue then that this “-oo” has the same meaning of “disturbance”, no matter what construction it is in, and “hok” generally means “above”, hinting at compositional structure. However, Collier et al. argue this example is not necessarily combinatorial, as the pyow-hack sequences could be interpreted as idiomatic, or have much more abstract meanings such as ‘move-on-ground’ and ‘move-in-air’, however in order for this analysis to hold weight, one must assume the monkeys are able to use contextual information to make inferences about meaning, which is a pretty controversial claim. However, Collier et al. argue that it shouldn’t be considered so far-fetched given the presence of compositionality in the calls of Campbell monkeys. 4) The author’s also discuss Branded Mongooses who emit close calls while looking for food. Their calls begin with an initial noisy segment that encodes the caller’s identity, which is stable across all contexts. In searching and moving contexts, there is a second tonal harmonic that varies in length consistently with context. So one could argue that identity and context are being systematically encoded into their call sequences with one to one mappings between signal and meaning. The authors use the above (very sketchy and controversial) examples of compositional structure to make the case that syntax came before phonology. Indeed, there exist languages where a level of phonological patterning does not exist (the go-to example being Al-Sayyid Bedouin Sign Language). However, I would argue that the emergence of combinatoriality is, in large part, the result of the modality one is using to produce language. My current work is looking at how the size and dimensionality of a signal space, as well as how mappable that signal space is to a meaning space (to enable iconicity), can massively effect the emergence of a combinatorial system, and I don’t think it’s crazy to suggest the modality used will effect the emergence narrative for duality of patterning. Collier et al. attempt to use some evidence from spoken languages with large inventories, or instances where single phonemes in spoken languages are highly context-dependant meaningful elements, to back up a story where syntax might have come first in spoken language. But given the physical and perceptual constraints of a spoken system, it’s really hard for me to imagine how a productive syntactic system could have existed without a level of phonological patterning. The paper makes the point that it is theoretically possible (which is really interesting), but I’m not convinced that it is likely (though this paper by Juliette Blevins is well worth a read). Whilst I don’t disagree with Collier et al.’s conclusion that phonological patterning is most likely the product of cultural evolution, I feel like the physical constraints of a linguistic modality will massively effect the emergence of such a system, and arguing for an over-arching emergence story without consideration for non-cognitive factors is an over-sight. I note that Collier et al are careful *not* to claim that any particular animal communication system is a evolutionary precursor of anything in human language – and they are right to be careful. I read the main point of the paper as: animal systems show that you can have syntax without phonology, so it is possible that syntax preceded phonology in language evolution. This is sensible, so long as we keep in mind that this language evolution may be (or even is highly likely to be) cultural rather than biological. I was pleased to see that Collier et al do not commit to any view that the evolution had to be biological (and hence that monkey syntax is is likely related to human syntax), but perhaps disappointed that they didn’t explicitly state this themselves.